The Kenosha 3 Drawer Night Stand is a classy storage option for your bedroom. Small but sophisticated, it features a dressy ash finish on the woodwork with a beautiful dark, stone accent top. 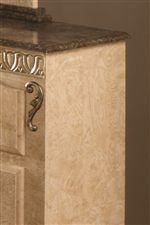 Traditional hardware pulls decorate each drawer front of the two lower drawers, while the top drawer features small hardware knobs. Three spacious drawers offer room for keeping valuables and other small items safe and sound. Perfect for convenient bedside storage, the Kenosha 3 Drawer Night Stand is charming piece to complete your bedroom. The Kenosha 3 Drawer Night Stand with Roller Glides by Lang at AHFA in the area. Product availability may vary. Contact us for the most current availability on this product. Storage Three drawers with roller glides. Drawer / Shelf Construction Deep drawer sides have a full height drawer back to keep clothing in place. Drawer Suspension Superb quality, traditional wood on wood drawers, that will offer continuous support and durability for years to come. Warranty A 2 year limited warranty applies on drawers. If a drawer fails to remain in operational condition due to manufacturer’s defect, a new drawer will be sent directly to your home. 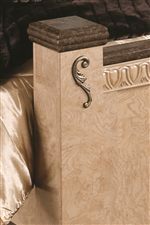 The Kenosha collection is a formal bedroom collection for a high class, sophisticated look. Featuring a dressy ash with a stone accent finish, Kenosha emanates soft, light tones with subtle contrasts of a dark tone to create a unique look that you will love for years to come. At the heart of its design are the Kenosha headboards, grandly-scaled with design details that draw the eyes from every angle of the room. Plentiful storage space is also provided with night stands, chests of drawers, and dresser options. Details like traditional mouldings, decorative hardware pulls, and scrolled accents all make Kenosha a classy collection to uplift your home. 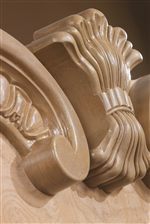 The Kenosha collection is a great option if you are looking for Traditional furniture in the area. Browse other items in the Kenosha collection from AHFA in the area.